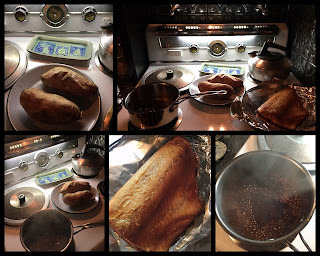 Combine Maple Syrup, soy sauce, sriracha and garlic in bowl (or gallon resealable bag), pour over salmon and marinate 20-60 minutes or longer, turning often. Preheat oven to 425º. Lightly grease baking sheet with nonstick spray. Remove fish from marinade, pat dry and place on baking sheet. Pour marinade in small saucepan. Bake fish 8-10 minutes. Meanwhile, bring marinade to boil them simmer until a thick glaze. Spoon glaze over fish just before serving. 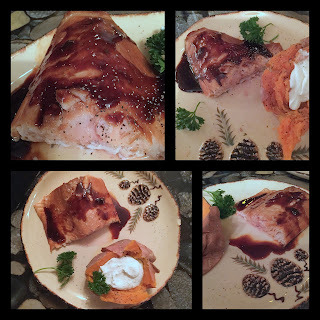 Great served with simple baked sweet potato topped with sour cream & chives.